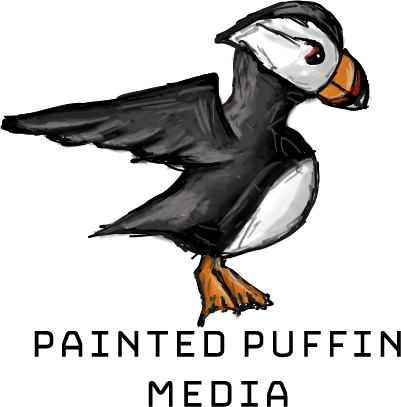 Painted Puffin Media is the creation of Katie Mortimore. Katie is primarily a photographer but also utilises her creative skills to produce beautiful and unique, whilst also functional websites and graphics. In addition to the bespoke services on offer Katie also offers prebuilt packages. Are you working on a budget and need complete branding for your business? Do you need a Logo and website? If so take a look at Katie’s prebuilt offerings. They are all unique, but as they are prebuilt, they are affordable for even the smallest of businesses. Katie has been building websites for nearly 20 years, having started by hand coding in HTML in the 1990s. Technology and Katie’s skills have developed somewhat since those early days. She now offers bespoke and pre built sites using WordPress software. WordPress is used for over 75million websites, that is approximately 1 in 5 of all websites on the internet. Once upon a time it was only used for blogs, but it itself has grown to power so much more, including large e-commerce sites. It’s ease of use makes it perfect for even those not technologically minded. When it comes to graphic design, this was a natural progression from Katie’s artistic ways as she was a keen artist working predominately in gouache paint in her younger years. Photoshop, illustrator and her trusty graphics tablet allow her now to create works of art in digital format. Each logo or graphic she creates is unique and individual ensuring stand out branding for her clients. Logos and graphics are predominately created using illustrator in vector format allowing for infinite scaling as required for large format scale printing. Katie is based on the Wiltshire / Hampshire border in the Military town of Tidworth. Where possible she meets in person with her clients on a regular basis to achieve the quickest and best results. Sometimes this is not possible but the beauty of the digital age allows her to have real time conversations with clients to finalise designs rather than going back and forth. Katie finds real time changes works far better for the client and is her preferred way of working for the final design stages. Thriving On Challenging Projects That Produce Bigger Rewards. When hiring someone to help create your branding ensure to choose someone who not just has the creative skills but who also has the right tools for the job. Katie’s photographic skills ensure she can create your site’s entire branding without hidden costs. It’s not just good enough to have a camera or computer they have to be up to the job including all relevant software.